Do you love the Hourglass Vanish Seamless Foundation Stick but don’t want to pay the price tag? I’ve got an amazing Hourglass foundation stick dupe! You will not believe this full coverage foundation stick is only $6. The other day I was testing out a drugstore foundation stick and it instantly reminded me of something. This particular drugstore full coverage foundation stick reminded me so much of my beloved Hourglass foundation stick. I thought it was too good to be true. 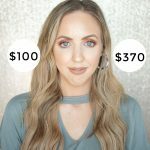 The next day, I tried the Hourglass foundation on one half of my face, and the drugstore dupe on the other half. They applied the exact same way, the shade was a perfect match (formula, finish, and wear is more important, but I had to mention this), the consistency was the exact same, and the finish was the exact same. 9 hours later, both foundations wore the exact same. You ready to see what this is? The Hourglass Vanish Stick Foundation dupe is…. the Wet ‘n Wild PhotoFocus Stick Foundation! Say what?! The Hourglass Vanish Stick Foundation is a cult favorite among many beauty enthusiasts. It is long-wearing, full coverage, and has a lovely natural satin finish. The exact same thing can be said for this new Wet ‘n Wild foundation, and I am so excited to have found a dupe. I get this question a lot – how do you apply a stick foundation? I typically think that brushes work the best with stick foundations because the consistency is thicker. Sponges tend to work well with a lighter consistency, in my opinion. What I first do is apply the stick directly to my face, all over. Then I’ll take a foundation brush and buff it in circular motions. My favorite high end foundation brush is the It Cosmetics Heavenly Luxe Flat Top Buffing Brush, and my favorite drugstore foundation brush is the e.l.f. Ultimate Blending Brush. I wish I had taken more photos of me wearing the Hourglass on one side of my face and the Wet ‘n Wild on the other side. I can’t seem to find any good before and afters to show you! I demoed this on my Instagram Stories and a lot of my followers messaged me saying they really couldn’t tell a difference between sides, either. In lieu of those photos, I do have a swatch photo to share with you. On top is the Wet ‘n Wild PhotoFocus Foundation stick. On bottom is the Hourglass Vanish Stick Foundation. The shades are just a hair different, but the formula, coverage, and consistency is nearly identical to me. I’d almost even venture to say that the Wet ‘n Wild one looks smoother on the skin. I truly cannot tell a difference between the two when I am wearing them on the face at the same time. If you’re looking for a good full coverage foundation stick, really give the Wet ‘n Wild one a go. Especially if you’re a fan of the Hourglass. Like this blog post? Make sure you check out some of my other drugstore dupe posts! …or see all of my drugstore posts HERE!